I could have tried to do a top 50, but that would have fell flat with my collection of games coming to 37 for now, so top 10 it is! I'm more than happy to have suggestions or criticisms about my choices,as my gaming tastes are ever evolving and I'm ever eager to discover new games with exciting mechanics. 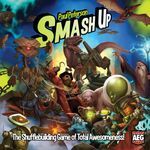 Board gaming has hugely improved my life and made me a much happier person. I wanted to get a deck-building game for a while, as it's a type of game that seems pretty much impossible to avoid when spending time on these forums. What I wasn't sure about is which to get, as Dominion looked a bit bland and negative comments about the DC Comics deck building game put me off. When I saw Legendary in the first UK Math Trade I ever participated in, I shortlisted it with a couple of other games and put in a money offer to join the trade (I'd rather have traded another game, but I had nothing to trade and really wanted to participate ^^). It paid off, as I was lucky enough to get into a loop receiving this wonderful game off the infamous Richard Ham! 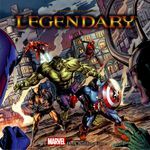 In Legendary, players are managing a team of superheroes, picking up new moves and abilities for them throughout the game and adding them to their deck. On a turn they get 6 of these cards and use them to add even more to their team and/or to fight various villains that are rampaging their way through the city. The goal of each game is to defeat the mastermind - which can be one of various well known marvel options - who in turn is trying to complete some kind of evil scheme, which changes from game to game too. As you play you gather Victory Points for your heroic deeds, which give you bragging rights (Victory) over your peers. Well to start with, I absolutely love superhero things at the moment, this is largely as a result of the amazing quality of the recent(ish) round of films from Marvel Studio's which make the opportunity to play as something of these characters a precious one indeed, not to mention the other films in the Universe by other studio's some of which are great too. In the game itself I love being able to strategies on ways to construct my deck that will lead to huge, powerful card combo's, and enjoy the discussion among players in trying to find exclusive needs from the available heroes that help to win the game as a group, but also get you the highest score among them! In addition I've found this game to be hugely accessible, and I'm yet to have found it difficult to get a group together to play. My girlfriend also really enjoys this game and on multiple occassions, we've run impromptu extension rules to let us keep our decks longer and fight epic combinations where we might have 2 masterminds at once, who get you drawing 2 villain cards at a time to match the mighty level our decks have reached. Great game, anyone who loves marvel superheroes should try it out, as it's well worthy of being my #1, with the top reason being a simple one..superheroes! About 3 years ago I let myself get involved with a couple of tabletop roleplaying games with the friends I'd met at University. While I'd known them for a couple of years I'd never really known much about this hobby they had and was reluctant yet also eager to get involved. I joined through Call of Cthulhu, Dark Heresey, Paranoid and All Flesh Must be Eaten games over about a year before trying out the GM role for myself, getting some Pathfinder books and running a haunting of harrowstone adventure with them. I really enjoyed the whole experience but burned myself out a bit on it, and stopped joining for games in the last year or so as I've not been a major fan of the systems they're currently running. As a result I had some desire for another way of scratching the same itch, in a lighter and less overwhelming environment. Step in the Pathfinder Adventure Card Game, a card game adaptation of the very system I'd run a little while ago! 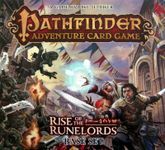 The pathfinder adventure card game has players controlled 1 or more heroes making their way through altered versions of adventures from the original Rise of the Runelords adventure path for the Pathfinder RPG. Your heroes are consistent from game to game, and their 'deck' of available skills and abilities is kept and refined through every game you play. IN an individual game, you are usually hunting down a villain and 'closing' locations to ultimately block him from escaping and defeat them once and for all! This game did an absolutely stunning job of filling the niche I was looking for. When I get this game out and play it with my housemate that I've been playing the game with, I get to use the same pair of characters that I've been improving and getting attached to since I bought it. Individual games are fast and fun, with us trying to plan what we do strategically to get our hands on the best possible cards for our heroes, while also closing down locations and taking out the villain with those strong enough to do so. Along the way I had one my characters die on me (Poor Lem) and felt quite sad about the loss, while also elated as I got to introduce a new character to our little group (Sajan) who's blessing madness has kept him in the run ever since. It's a shame the 6 adventures are so spread out, as I can't wait to get them and play them all in both that game and with others in days to come. I think to pin down what makes this game worthy of being #2, it's consistency. Anyone looking for a game to scratch a roleplaying itch without having an entire evening to spend doing it, this is something you should look at. To be completely honest, I can't remember what made me find out about this game! Certainly the thing that made me want it is that it has a variety of hugely different factions that interest me which can be smashed together to make weird combinations to play with. Something about the randomness of that and the ability to play Zombie Dinosaurs just meant I had to get it, and it's expansion Awesome Level 9000 in one impulse buy! This game really feels like it fills a massive niche in my collection. It's huge variety of factions means it has something that appeals to everyone I know, and the fairly simple (Albeit with the possibility of getting complex) mechanism means it's easy to teach and get people involved. I have a huge number of plays with this game compared to anything else I own, and have enjoyed every time win or lose (More often lose, I did an elo trace for a while and was comically behind, everyone always picks on me for owning the damn thing and I wanted to prove it! ^^). I don't think I've ever failed to get people interested when I've dived for this game as an option, and while my eagerness to pick this over my other games has waned, I think it's a long time before I stop finding it fun, and a long time until I stop buying expansions to add to the variety in it! If there's one thing that makes this game deserve it's spot, it's accessibility. I think everyone should get exposure to this great game at least once! Well, in actual fact I didn't buy this, I got it for Christmas last year (2012) although I would absolutely have picked it up anyway had that not happened! I've actually been looking at kickstarter occasionally long before I started backing board game projects, and saw the Zombicide project when it was running, but while it looked interesting, I'd not got into proper board games yet and the $100 price looked way too steep. When it came out at retail, I'd started watching Wil Wheatons tabletop and played a number of great games at a nearby tabletop society, I felt I had to take up this opportunity, and when I got asked what I'd like for Christmas, this made the cut along with Galaxy Trucker! 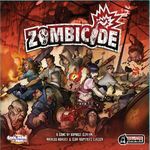 Zombicide is an absolutely epic scale survival game, where players control a set of survivors trying to make their way in a world inflicted by a Zombie apocalypse. Each survivor has it's own set of unique skills which they make use of to cooperatively combat the doom approaching them. Zombies spawn between player rounds, and as the players kill them and complete objectives, the spawns get gradually more intense too, threatening to overwhelm if players don't work together effectively enough! This game is absolutely fantastic! After I received it last year, I got to play this many times with a couple of my close friends as well as at the Friday tabletop society I attend. Games have a truly epic scale to them, lasting many hours at a time yet keeping me and the people with me riveted the whole time. Much discussion goes into most effectively going about objectives, how to save idiots (me!) from hordes of zombies and more. The game includes 10 scenario's, with a huge additional variety available from the guillotine games website when those are exhausted, this leads to massive re-playability. I kick-started the second season of this game which makes some great additions, with new species of zombie and some extra mechanics for the added Prison. I've enjoyed my plays of the new content so much already, and it only adds to my excitement about this game, I get the first set of stretch goals delivered tomorrow to my parents so hopefully I can pick those up and get games going with those too! To add just one more remarkable thing about this game, despite it's length, it's always easy to find players who want to experience the apocalypse too. This is just a straight up ameritrash cooperative playground that I think I'll never stop enjoying. I didn't buy this one either! I received this for Christmas in 2012 alongside Zombicide & Through the Ages (Which I sold earlier this year, but it wasn't fun for my group). Actually to be precise, I wanted this enough that I impulse bought it a couple of weeks before, got complained at as it was going to be bought as a present, and let them pay me for it to give to me at Christmas, so convoluted ^^. I played the base game at the tabletop society at the University of Birmingham first, which is where I met my girlfriend who I'm still with now (Yay!). Galaxy Trucker is played in 2 phases, the first is a frantic building phase, where players grab face down component tiles in the middle of the table, turn them face up and choose to build them to their ship or put them back for others to potentially take. There are 3-4 rounds over which ships have bigger and more complex layouts in each. The 2nd phase is a race of sorts, a deck of cards is made up that is revealed one by one, causing events to happen letting players pick up cargo, charge ahead, fall behind, lose components and more, a poorly built ship can soon become a very small ship over this bit of the game! I've read many peoples comments on boardgamegeek, and heard from others, that the only part they like about this game is the building phase, as people get to try and make an optimal ship that's perfect and immune to attacks. Those people then don't like the race phase, where they feel they have no control over the cards and are just 'watching' as their ships get destroyed. I think those people are missing the point, as the way I look at it, is that sure, the first phase is the game, but the second phase is for being social and getting to know the people you are playing with. It's an absolute blast to discuss how things are going, what's happening to your ship, have light-hearted arguments about a certain friend stealing all the lasers and anything else that comes up while the cards are revealed, and it's a great game to play when meeting new people. Possibly my biggest issue with the game is that I don't think I'll ever get to use every little expansion component that's in the anniversary edition box. That's because of my use of this game in getting to know new people, which reduces how easy it is to make the game too complex. Ships are pretty easy to get people into though, and I will happily get future expansions adding more of those as they let me put lots of variety into a game even with new players (Latest Models is awesome). Brilliant game, that's more social than I would expect at a glance. This is another game that started it's life as a kickstarter project, although I didn't back it at the time due to not having got into the board-game hobby yet. I don't remember if I saw it while it was running, but certainly I ran into it's project page long before buying it and was hugely excited by the steampunk theme and airships. When I saw this available online earlier this year I looked over the games I had and saw no pick-up and deliver games, that was all the excuse I needed. In Kings of Air and Steam players are airship captains trying to make their way in an awesome steampunk world. Each has their own airship to pilot with it's own ability, which they use to fly around factories on the map picking up goods. Cities in the world won't allow airships to land in them, and as a result you need to drop goods off at a train network that you'll build as you play, to ship it on to where it's wanted and earn money and victory points. Movement is managed by planing 4 moves at a time and executing them simultaneously with other players, making you have the need to be strategic to not be beaten to the punch on getting the goods and deliveries you need. As the game continues the value of goods rises, and that shifts where people want to be and introduces competition in parts of the map where there might otherwise be none. I don't know what it is about this game, but despite the fact I've lost my last few games (It's ever so hard to remember your own plan when teaching a 6 or 7 player game!) I've had so, so much fun anyway. I love the movement programming, and trying to get in your opponents heads to find ways to get the best goods first, and more importantly get them to a city that wants them. Over a 7 player board this gets absolutely hectic, with it being a true challenge to get anywhere, and not have a certain player steal money and goods from our ships. I find it odd that I can't think of much else to say, as it really is ever so fun, so I'll finish with saying this is raw steam-punk aeronautical genius, that really makes you think. Earlier this year I came across a kickstarter project for a game called Euphoria. At first I was only interested in it for the cool dice, and wished I could get them by themselves, but as I delved deeper into what the game was about, I fell first into wanting it fully, and secondly into following Jamey's blog on the Stonemaier Games website. Through the blog or kickstarter he mentioned his previous campaign, Viticulture, which he made a second chance at through a charity auction to use up some of his last few copies of the kickstarter edition of the game. I guess I was in a charitable mood as I dived right in while knowing almost nothing about the game, and not particularly thinking I'd win. I did, and I'm so glad for it! 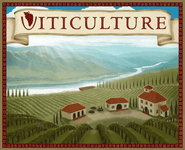 Viticulture, also known as 'The Strategic Game of Wine-making', is just that, a game about running a vineyard and producing wine, which you then use to fulfill orders and earn money + victory points. The games components and artistic style absolutely ooze theme and help to bring out the experience as you play. You do so with a worker-placement mechanism, where you take various actions in summer and winter (Setting up your vineyard in summer, and harvesting and selling your produce in the winter). Well, to start with this is my first and favorite worker-placement game. While I've played euro-y games before, this was quite an extreme and a shock to the system, and opened up a whole new avenue of games for me to buy and play. I don't like wine, and won't touch the stuff with a barge pole, but playing this for the first time was my first exposure to the romanticism of the vile fluid, and gave me a huge feeling of achievement in building up and running my vineyard. I absolutely love every game I play, and find that it gets me thinking a lot harder and feeling more invested than the other worker-placement games I've played since. A short while ago a contest was run to help with the development of the upcoming Tuscany expansion for viticulture. The rules were simple, it has to work with the base game, and have an extension to each players individual board. I love making custom content for things, with games being no exception, and I'm so happy to have taken part in the contest, developing an idea, playtesting, modifying, testing some more and ultimately sending it off to Stonemaier Games where the designer of the game himself got to try out my expansion, mine! I didn't win, but I loved the experience and wish I could get involved in such a way with the gaming world more often. All in all, a brilliant introduction to worker-placement, as well as still being the best I own. On top of that is the theme that while I didn't initially love, I've learned to, and have even found it opens up people to gaming I'd never expect (My girlfriends Dad joined us for a game for example, which was very interesting to teach!). Just, absolutely amazing, thankyou for this one so much Jamey! Looking forward to next year to support the expansion ^^. I'm not sure if it was late last year or early this year, but around that time I first got exposed to 7 Wonders. I find 7 Wonders to be a bit of an odd game, in that I think the drafting mechanic and collection of certain cards to go for victory is very interesting, but the theme feels so tasteless that I don't enjoy playing it. As a result I wanted something similar, but with a more exciting theme, somehow I came across 'Among the Stars'. For a while I was unsure due to the 4 player limit (We always seem to have 5+) so it wasn't until I discovered the kickstarter which, among other things, increases the player count to 6, that I decided I wanted to have it, and did so as well as backing the expansion which should arrive soon! In Among the Stars, players are, in a similar manner to 7 wonders, drafting sets of cards to build something, in 7 wonders it's an empire/city or something, but in AtS it's a Space Station. The big thing that differentiates it here, is that each component you build is important in a geometric sense, as you position the components on your space station to try and get more points (e.g. '2VP +1 for each adjacent location' might be on a card). Additionally, you have extra options when you discard a card, you can choose between getting money (Much more important here, as all components cost something) or building a power reactor to be able to power up more expensive components with huge VP values. This is an absolutely brilliant game where I get to build something amazing, in any way I want. I've never had a game where players try to follow the same tactic, and stations end up appearing unique and interesting as a result. There is a brilliant variety in the cards that makes each hand unique, and while all 4 years have the same level of cards, you find that the strengths and weaknesses of each advance as you construct your station and mould it around them. I do have issues with this game, primarily it's 3-4 player limit that makes it difficult to get games together and I don't get to play it nearly as often as I'd like. The lack of difference in options through years, while it does vary due to previous placements, also grates a little. On the bright side, the expansion 'Ambassadors' is soon to arrive, and it increases the limit to 6 players, adds a load of extra components, and brings in a new ambassador card type where you have a set for the first 2 years, and another for the latter 2, bringing in that advancement in options that the game feels it's missing at the moment. Very good construction game here, one that I'll treasure for as long as I continue to love ridiculously shaped space stations, so a long long time! I bought quarriors because I enjoy playing it. Each month there is a tabletop games group that meets in Birmingham which I try to attend when I can, and at that event I was introduced to quarriors. It's a quick fun game where you get to roll tons of dice, has lots of expansions (A + point for me) and is easy to teach to new players, which tends to be something I do a lot! 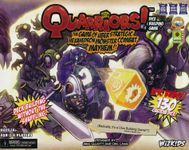 In quarriors players are trying to build quiddity to buy various creatures and summon them. When a player summons a creature, it attacks all the other players creatures potentially taking them down to be revolve until that player can summon them again. If you can keep your creatures alive through a whole round of other players turns, you gain glory (VP), the first to a set amount based on number of players is the victor. The available creatures/spells to gain each game are randomized, and that makes each game quite unique. I hesitated about putting this in my top 10 for a while, as I don't often feel motivated to get it out to the table. I'm not sure why this is, as it's a fun game, but perhaps it's because lugging a lazy susan around to make the game as good as it can be is a bit of a pain ^^ (It lets you rotate available creatures/spells so players can read them easily, there's a lot of text). It is a great game though, and I love introducing people to it and having epic dice off's to try and gain victory. The addition of quests in the Quartifacts expansion only make the game better, opening up an additional avenue to gain points and other bonus's, as well as a convenient mechanic for players don't badly to catch up, as they're less likely to be bumped from a quest if they're doing poorly. I don't know really, as I wasn't sure at the time if this was the kind of game I'd enjoy or not! I remember umming and aahing a lot about whether I was interested, and I think the ultimately sway was that the kickstarter price was very good, and Richard Hams 'Rahdo Runs Through' video made me buy it (It wasn't my choice I swear, blame Richard!). Gear & Piston is based in the earlier years of the automotive industry. Players are engineers who are trying to build prototypes of vehicles which they can then use to attract investors and, presumably, get hired or funded to start their own motor company. All this is done using a worker placement mechanic where players can do back-alley dodgy actions, design new parts, find old ones in a junkyard and ultimately spend time tinkering with their design to make something that goes along. The back-alley actions are quite interesting, as you get the option of drawing 3 new parts and taking 1, stealing a part, or changing your priority order elsewhere in the board, to go first or maybe last (Last player to the workshop goes first next round). I feel like this is a bit of a controversial choice as I've only had it for less than a month, but on the other hand there's not a single other game on this list that's even reached a year old, and this isn't too far behind in plays as I simply don't have time to give all my games a fair chance (Sadness!). Nevertheless I think it deserves to be here, as a very fun light worker placement game with a theme that many people like (Or don't dislike at least). I'm having a lot of fun with this game and am looking forward to trying out the mini-expansions that came with the kickstarter to spice it up even more. The other reason that it got to being number 10 is that I used the tried and tested method of comparing to other games I own and saying 'which would I rather play'. For clarification of why that matters, game 11 in my list would be the Manhattan Project. The Manhattan Project is a very good game, but it just doesn't work well for people I play with, as the air strike mechanic doesn't leave people feeling 'Oh, well I deserved that' but more 'I hate your soul' and goes a long way to killing the atmosphere in a room. As a result, despite being well designed and with cool ideas, it loses out against gear & piston that is a load of fun for everyone who plays, not just the person who talked his way out of being bombed to hell. On top of everything else, the developer of this game LudiCreations are just a really cool company who also made another game I enjoy at the moment (Byzantio). With the fun I've had from this and Byzantio, I'll be keeping an eye on future projects from them in the months/years to come. Oh, one last thing, I love that if you don't finish your car in time in this, you can complete it with 'scrap' components, that the art for is like a 'jack-of-all-trades' component that has a wheel, steering column, fuel, engine, etc all as one thing, so silly but so cool!